Notes: Founded in 1853 and on the Charente River, Louis Royer is one of those cognac houses that everyone else in the world seems to know but are relatively unknown and unrecognized in the U.S. In order to remedy this (for ourselves and our readers) we went on a tour of their Cognac House (distillery and aging warehouses) in Jarnac, France last year. A link to all our photos can be found here. 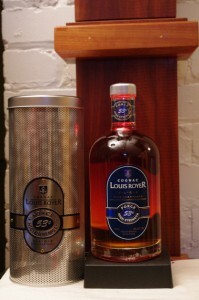 The cognacs they currently offer in the United States are this one a 106 proof expression designed for the US market and for mixing , a VSOP , and a XO . They also produce a number of Kosher expressions ( not reviewed here yet) .There are other expressions such as their single region or single cru bottlings – but sadly they are not imported to the US – at least not yet. Double distilled in copper pot cognac / charentais alembic stills from a base wine with lees it is then carefully aged in a specially selected series of French Limousin Oak casks until ready to be blended. This one is designated as a Fine Champagne VSOP (meaning most if not all the eau de vies that make up this one are from the Grand and Petite Champagne Crus (or growth area). These area yields some very nice eau de vies (unaged grape brandy which are aged to produce cognacs). The Grand Champagne is the most delicate and requires the most aging to tease out it’s potential while the Peitite Champagne cru/growth area eau de vies, not as delicate as the Grand Champagne, have a lot of backbone and nice fruit to them and age more rapidly. This means they may not be as delicate as a Grand Champagne growth but that also means a broader and wider range of taste and depth. VSOP means Very Special Old Pale and all VSOP or any of the blend must be at least 4 years old and usually a good bit older depending on the brand. Appearance: Attractive dark straw gold color, leaves thin coat on swirling. Could be mistaken for a bourbon in color. On swirling it starts with a scalloped edgeline then forms very thin legs or tears. First Impression: Dried fruits, dark fruits like plums, apricots, with some nice oak, and a touch of leather and tobacco. It has in addition a nice rancio. Adding a little water opens it up nicely and yields even more of the above scents. Taste: Almost more whiskey like in some ways compared to some cognacs in terms of the oak and tobacco element but these are melded with dried fruits, saddle leather and floral elements that are distinctly cognac. A bit more of a closed, masculine bouquet than their other expresssions, but a well balanced and interesting spirit. Drinks: Worked well in a Black Pagoda (basically a brandy Manhattan – see Gary Regain’s Bartenders Bible) and everything else we tried. In terms of mixing think of it as a nicely aged other brown spirit swap in ( subsitute it for a rum, bourbon, Speyside or Highland Scotch) and you will be delighted with the results. Also very nice on it’s own and eminenetly drinkable – a nice change from the usual – whether that be a other cognac or another aged spirit , and no you don’t need a brandy snifter – just a decent glass (such as a Riedel Stemmed Cognac glass) to enjoy it . Bottle: Simple clear glass apothecary bottle (bell) tastefully executed deep blue with white and gold print oval/lozenge shaped label and matching neckwrap and finished with nicely solid silver colored screwcap that seals well. The shipping/gift canister is made of sturdy finely pierced metal and the metal label is riveted to the canister. A very masculine but classy presentation. Other: Their trademark/seal/crest is a bee the meaning of which they state is : “diligence, an efficient and lively organization, and regional and craftsman work.” Nicely said. Final Thoughts: A nicely done, smooth, balanced cognac with some real backbone and punch to it (in a nice way). Value is excellent especially if you consider you are getting a much higher proof .